The buyer’s appraisal in the purchase process is of crucial importance. Most buyers will be using some form of financing, and virtually all forms of financing will require that an appraisal be done – even if you the seller paid for an appraisal prior to putting your home on the market. A lot of people fear the appraisal process – primarily because there’s a lot of bad information out there in the public domain about bad appraisals. The buyer’s appraisal is usually no big deal. The appraiser will be given a copy of the purchase agreement, so they know what price they can’t come in below without risking the deal to fall apart. The appraiser will try, if at all possible, to validate the contract price using recent, comparable sales in the area and similar, currently listed homes. Unless there is just no way to support the value of the contract price, the appraisal will typically come in at, or slightly above, the sales price. Sometimes, it will come in a healthy margin above the sales price, but this doesn’t happen too often. If the appraised value is too much higher than the contract price, the lender’s underwriter may make the appraiser to extra work to justify the appraised value – and who needs extra work? In the event that the property appraises below the contract price, the buyer will typically have the right to cancel the sale. More typically, the buyer will try to re-negotiate the sale price, to get the seller down to the appraised value. The seller is under no obligation to do this, however. 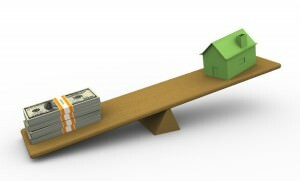 The seller can insist that the buyer make up any shortfall by increasing the cash they have in to the deal, so that the buyer maintains the debt-to-equity-ratio as required by their loan. If a buyer lacks enough cash to do this, or at least claims to lack the cash, many sellers will in fact lower the contract price in order to keep the deal together. The appraiser may also note that the value given to the property is subject to certain repairs being made. If your property does not contain any visible defects, it is unlikely that the appraiser will make the value subject-to any repairs. However, this is a completely arbitrary process: some houses may require tens of thousands of dollars of basic repairs, and the appraiser will not make a mention of it. Other properties may not seem to require any work whatsoever, but the appraiser will not small defects such as missing door handles that the lender will require be repaired before they will loan on the property. If the buyer’s lender ends up requiring repairs, the seller is not obligated to make such repairs. The seller can insist that the buyer make or pay for those repairs – this too is an item to be negotiated.